Exclusive All-New Cut From The Producers Of The Original Highlander -- Featuring 12 Minutes Of Added Footage Not Seen In Theaters! 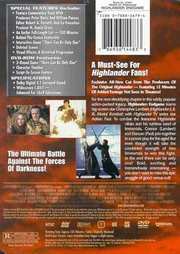 For the next electrifying chapter in this wildly popular action-packed legacy, Highlander: Endgame teams big-screen star Christopher Lambert (Highlander I, II, II, Mortal Kombat) with the Highlander TV series star Adrian Paul. To combat the fearsome Highlander villain and his ruthless band of immortals, Connor (Lambert) and Duncan (Paul) join together in a power play for the ages! But even though it will take the combined strength of two Immortals to win this fight, in the end there can be only one! Bold, exciting and tremendously entertaining - you don`t want to miss this epic struggle of good versus evil! Interactive Game "There Can Be Only One"
3-Round Game "There Can Be Only One"
In 1986, a legend was created by a UCLA film student. A legend that told of an immortal warrior`s battle through the ages for an incredible prize - power beyond imagination - and unleashed upon the movie going public the power of the quickening. That legend was Highlander, the creator Gregory Widen. First introduced via the stunning visual canvas of Australian Rock video supremo Russell Mulcahy`s 1986 cult classic, the enigmatic Connor Macleod, played with brooding charisma by French Tarzan star Christopher Lambert, became the inspiration for a television series, animated show and two further movie adventures. Until now! 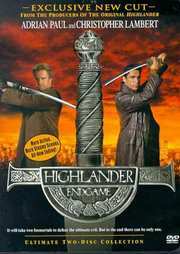 `Highlander: Endgame`, the forth instalment in the series, unites the aforementioned movie actor with his television counterpart Adrian Paul in a story which pits their centuries of cunning and instinct against the Vengeful Jacob Kell, played with tongue in cheek excess by Brit actor Bruce Payne. With an aim to avenging the demise of his father at the sword of Connor MacLeod, the seething, malignant Kell has amassed an army of loyal fellow immortals who will stop at nothing in their quest to destroy everything Connor holds dear. If Kell wins the prize, mortal man will suffer an eternity of Darkness. Joining forces, Duncan and Connor must fight to preserve the fragile balance of both personal and universal existence in a game in which only one can survive. Borrowing inspiration from both the original movie and newer, more contemporary fayre like `The Matrix` this latest opus brings the `Highlander` legend bang up top date with its seamless array of swordplay and kinetically energised martial arts. In that sense, it`s taste is excellent. It has the visual slickness of the classiest MTV clip, and the romanticism of the very best period drama. Directorially, the film suceeds in drawing the fine line between eye catching visual style and chaos, opting more for the restrained excellence of Mulcahy than for the messy ill conceived montage of Michael Bay, director of the best forgotton `Armageddon`. Technically the disc is a delight, with pin sharp resolution and very few artifacts. It has a rich, dynamic soundtrack which delivers a realistic matrix in 5:1 Dolby Digital, and a fully animated menu to die for. With a wealth of related trailers, a second cut of the movie - a previously unreleased extended edition - and a substantially informative behind the scenes featurette, this two disc package should, at the very least, set a benchmark for many such releases to come!